So let’s break down the statement by BV Suddhadvaiti Swami (sadm) (yes, my analytical nature got the better of me). Recently Premananda dasa brahmacari published a biography of Srila Gurudeva, Sri Guru Darsana, in which he presents, in the section 1978-2010, pages 509-511, a fabricated story about Srila Gour Govinda Maharaja. He claims that, prior to meeting Srila A.C. Bhaktivedanta Swami Prabhupada, Srila Gour Govinda Maharaja approached Srila Gurudeva in Kesavaji Gaudiya Matha in Mathura and asked him for initiation. He says that Srila Gurudeva declined and instead directed Srila Gour Govinda Maharaja to go and take initiation from Srila Bhaktivedanta Swami Prabhupada. I haven’t read the book, but I expect this story exists in Sri Guru Darsana. If it does – this in itself is extraordinary. I don’t remember when Gurudeva first accepted taking initiations, but I find it very strange that Gour Govinda Maharaja ever asked Gurudeva for initiation. Gour Govinda Maharaja was initiated in 1975. The section regarding this is from 1978 – 2010. So did Gour Govinda Maharaja ask for initiation *after* he already was initiated? If so, I would be even more surprised. I have read the biographies of Gour Govinda Maharaja available from Tattva-vicara publication, and this is not mentioned anywhere. When it comes to sadm’s other stories which goes to Premananda Prabhus character, it seems like sadm so far is left to fend for himself and that nobody openly confirms his stories. But it is nothing short of extraordinary if Gour Govinda Maharaja went to Gurudeva and asked for initiation. The extraordinary would be that it was so little known and not mentioned anywhere except in Premananda Prabhus book. Your Gurudeva’s response to Giridhari Prabhu about the Premananda Purana harmonizes it though. One time a godbrother of mine in Colombia attended a series of Bhagavatam classes and was asked at the end: “Who was the first created living entity?” to which he responded “Adam”. My (diksa) Guru said about him: “You might think he’s a fool, but I wish I was as close to Krishna as he is”. I don’t understand how Gurudeva’s response to Giridhari Prabhu harmonizes it. he he, I don’t even understand the response from your diksa guru. Is it that there may be some fault, but service is glorious? But again, we have the conception that a high class devotee is without faults – especially that a person doesn’t talk untruths. My Gurudeva has advised that to not become hard hearted we ought to judge a devotee’s character by his bhakti, not his bhakti by his character. Krishna accomplishes many things at once, and what he arranged for me with all of this was that I got curious about Prabhuji’s hari-katha and went to the Bhaktabandhav website, and found that they just recently published transcripts and audios of all lectures and conversations from your Gurudevas visit to my Gurudevas ashram in 1996!!! There does seem to be some lila going on. Premananda Prabhu plays his part, and BV Sudhadvaiti Swami plays his. So good that you found transcripts from that darshan! In 1973 HDG Srila Gour Govinda Swami, who was a devotee of the Lord from his birth, renounced family life and became a wandering sadhu known as Gour Gopalananda. He wore saffron cloth and carried with him a copy of the Bhagavad gita, a pen and notebook as he travelled through the sacred sites of Bharat varsa, India, searching out that divine personality who could clearly explain to him the meaning of the Bhagavatam in light of Mahaprabhu’s teachings. 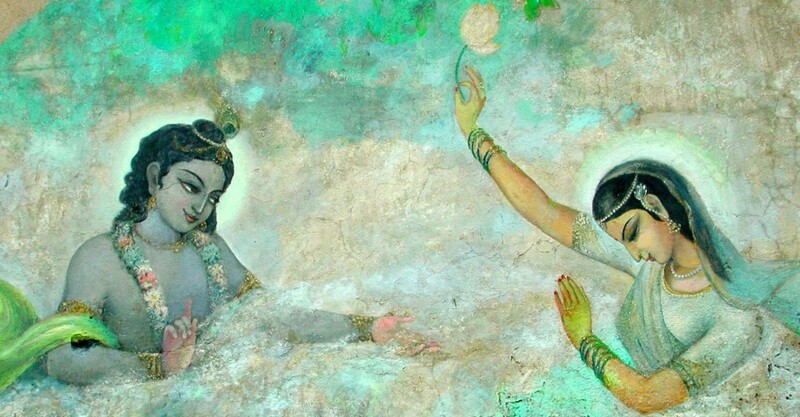 After visiting many of the pilgrimmage places in northern India where he spoke with a variety of sadhus, yogis and holy men, knowing that his quest had met with no success, he decided to head down to Lord Krsna’s own sacred land of Sri Vrndavan dhama, where surely the Lord would fulfill his desires. Upon arriving at Mathura-Vrndavan he visited different asramas, where because of his outward appearance of matted hair, beard and torn saffron gamcha it was usually assumed that he was simply another wandering sadhu, not a vaisnava. During this time he spent four days at Sri Keshavaji Gaudiya Matha in Mathura. Whilst wandering through Vraja dhama he eventually headed to the Iskcon property at Raman Reti where the Sri Sri Krsna Balarama Temple was still very much under construction. There is no need to argue other points here. It is irrelevant unless people sincerely want to understand the truth and have open minds. All sorts of opinions can be found about all sorts of popular personalities. Intelligent people do not believe rumors or hearsay that is spread by those who are likely biased and bear a grudge or act from party-spirit or who are not self-realized. The fact is simply that hundreds and thousands of people receive inspiration to perform bhakti from the guidance of Premananda Prabhu and those who actually live in the ashram with him for a short time become witness to his impeccable character and incessant engagement in bhakti. There is no argument that Gour Govinda Maharaja visited Sri Keshavaji Gaudiya Matha in Mathura, everybody agrees on that (it’s also mentioned in/confirmed in Madhava Maharajas biography if I remember correctly). The point of contention is wether Gour Govinda Maharaja went there to seek initiation from Gurudeva. I actually tried to find Sri Guru Darsana when I went to Vrindavin, but I had no luck getting it. I prefer to make up my own mind on things by going to the source, rather than just quoting third parties.